Cook the macaroni according to package directions; drain and set aside. Heat the oil in a skillet; add the peppers, onion, and garlic, and saute until soft. Add the ground beef and saute until browned. Add the tomatoes, salt and pepper to taste, and the basil, cumin, and oregano. 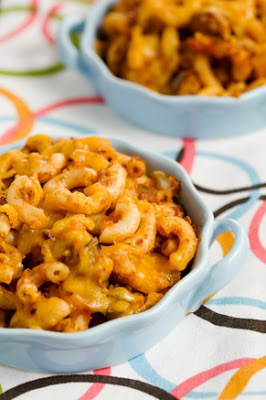 In a large bowl, combine the macaroni and the beef mixture. Spread this mixture into a 9 x 13-inch baking dish. Top with the cheese and bake at 350 degrees for 20 to 25 minutes, or until the cheese is lightly browned and bubbly. Cook’s Note: Ground turkey or chicken can be used in place of beef, if desired.